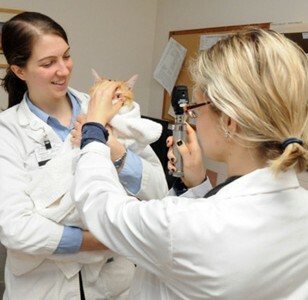 The Ophthalmology Service at the Foster Hospital for Small Animals is home to two faculty board-certified ophthalmologists, two ophthalmology residents, an ophthalmology technician and a primary liaison, all dedicated to providing medical and surgical management related to injuries and diseases of the eye. 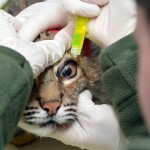 We recognize that, in most cases, as a primary care veterinarian you can identify and treat most routine eye problems. 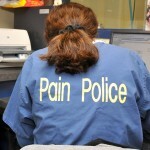 In some cases, however, you may want to seek the advice of a specialist. We view our relationship with referring veterinarians as a partnership and welcome referrals for patients who clearly need the care provided by an ophthalmic specialist, as well as those for whom you may just be looking for advice or a second opinion. Through our evaluation process, we will maintain an open line of communication with you and, if appropriate, the pet owner, whereby we provide clear and complete explanations of the diagnostic testing results, treatment options and the cost so that you and your client can make the most informed decisions. The Foster Hospital for Small Animals Opthalmology Service offers among the most advanced and comprehensive diagnostic and treatment practices in New England for small and large animals. The majority of our cases are canines and felines, and we also treat horses and exotics. We provide both scheduled and emergency services for animals with vision or eye problems. From routine eye exams to specialized surgery, including laceration repair to corneal grafting to cataract removal, we provide a full range of diagnostic and surgical services. Our ophthalmology team works closely with its peers in anesthesia, pain management and other specialty areas, providing a full continuum of coordinated care for your client. As New England’s only veterinary school, we also have clinical research studies under way that offer your clients access to innovative treatments not available elsewhere. 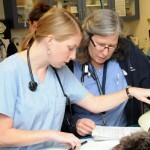 Upon referral, our clinical liaison team will facilitate care, schedule appointments and serve as the contact point between Tufts clinical specialty departments, referring veterinarians and pet owners. Their commitment to keeping the lines of communication open ensure that you receive the highest standard of care for your patients. If you are in need of emergency services, the Ophthalmology Service is available 24 hours a day, 7 days a week. To make a referral, you may contact the Ophthalmology Liaison at 508-887-4696 between 8:00 a.m. and 5:45 p.m. After regular business hours, you may call emergency services at 508-887-4623. For large animals, please contact the Tufts Hospital for Large Animals at 508-839-7926 for care during any time of day. Christopher Pirie, DVM, DACVO, a board-certified veterinary ophthalmologist and faculty member, is a graduate of the Ontario Veterinary College, University of Guelph, where he pursued a veterinary degree. He later pursued an ocular pathology fellowship at the Comparative Ocular Pathology Laboratory, University of Wisconsin. Dr. Pirie joined the faculty and ophthalmology staff following completion of his residency in ophthalmology at Tufts in 2009. His research interests include clinical optics and diagnostic imaging. He is focused on the development of more cost effective ophthalmic imaging devices, with the ultimate goal of increasing availability, improving upon early detection and treatment of a variety of ophthalmic conditions. Stefano Pizzirani, DVM, PhD, DECVS, DACVO, a 2004 board-certified ophthalmologist and Tufts faculty member, is a 1979 graduate of Pisa University (Italy) and a 1999 PhD graduate from Messina University (Italy). Dr. Pizzirani spent 22 years in a specialty practice in his hometown of Florence before relocating to the United States and serving as clinical assistant professor at North Carolina State University. In 2004 he joined the Cummings School of Veterinary Medicine at Tufts University as assistant professor. Dr. Pizzirani is also a board-certified, inactive-member of the European College of Veterinary Surgeons. 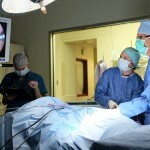 His fields of interest include intra- and extra-ocular surgery and the pathophysiology of canine glaucoma. Kara Gornik, DVM, a third year ophthalmology resident, is a 2010 graduate of the University of Georgia College of Veterinary Medicine. She completed her internship at Michigan State University. Following her rotating internship, Dr. Gornik spent a year pursuing research in vision and genetics at Michigan State University before starting her ophthalmology residency at Tufts in 2012. Alex LoPinto, DVM, a first-year ophthalmology resident, is originally from New York, graduating from New York University in 2009 with a degree in Biology. He subsequently received his veterinary degree from Cornell University in 2013, where he performed a research project on methicillin resistant staphylococcal infections of the canine cornea. 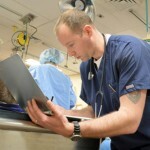 After graduation, he completed a small animal rotating medicine and surgery internship at Red Bank Veterinary Hospital in Tinton Falls, New Jersey. Dr. LoPinto enjoys all aspects of veterinary ophthalmology, but is particularly interested in corneal diseases, cataracts, and intra-ocular surgery. Tracy Elmes-Young, a veterinary technician specialist, is a 1987 graduate of Mt Ida College and an integral member of the Small Animal Internal Medicine team. She came to Tufts in 1986 and worked for the department of small animal medicine as a technician and senior technician until 2011 when she joined the Ophthalmology department. She is a charter member of the Academy of Veterinary Internal Medicine and is currently the credentialing committee co-chairperson.